add and remove ACLs on your object depending of hour of the day. This new feature closes the first milestone of backup. Thanks to 2 new plugins, you can now be notified by emails of finished backup processes (ie: scheduled "full backup", "snapshots" or "disaster recovery"). Now you can't forget it: we'll produce a digest and send to a list of recipients. In the future, if XenServer will include a dedicated CloudConfig Disk plugin, we could imagine to provision your VM with SSH ready access, auto-disk growing and all the features exposed with CloudInit. Using the same button as before, and if your VM support quiesce, XO will automatically create a quiesced snapshot! You can install all missing patches for one host, or on your whole XenServer infrastructure! Having your whole XenServer host patched and up to date never been so easy! Your keyboard events are now only grabbed when you have your mouse over the console itself. The global behavior of the console view is far better! More details can be found in the dedicated article: XenServer emergency shutdown. No need to know which VM is currently running on it, everything will be executed automatically. Back logs are now displayed with their name/tag, not their ID. This way, it's easier to locate a specific job. 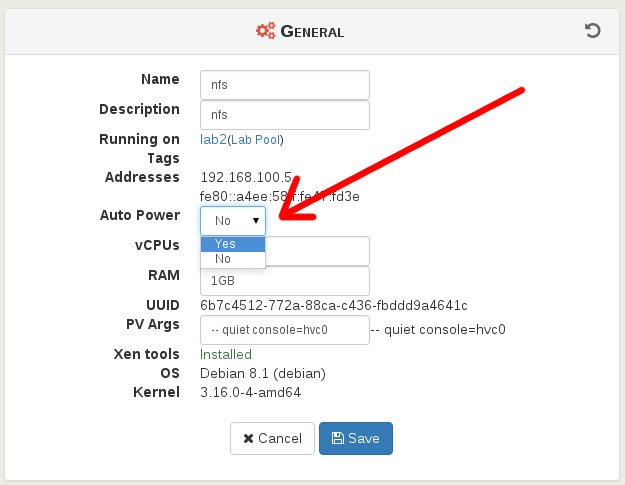 Activate "Auto Power" on a VM will also configure the pool accordingly. Read our blog post for further detail. When you chose to disconnect a server in the Settings, it won't be reconnected even if you restart xo-server: the state (connected/disconnected) is now saved. Warning: this should be only used for advanced analyze. Performance impact could be important. This will display extended logs, with IP address of any connected clients, detailed methods parameters etc. We'll focus on the new interface, as we already explained here. But until then, you'll have a nice exclusive backup feature coming soon. Stay tuned!